News and Events - Page 2 of 4 - Russell Rescue, Inc. 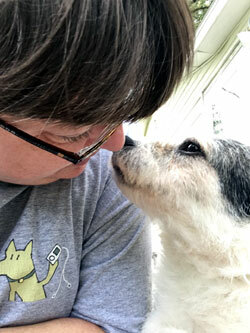 Written by: Sandra Jolley, Coordinator, Russell Rescue, Inc.
On July 8, 2018, a woman from Iowa named Ruby filled out the online volunteer application. 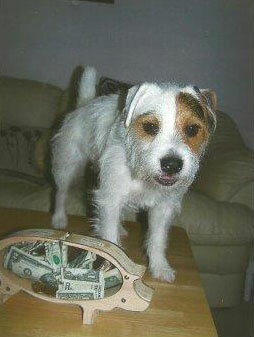 She had seen an ad on Craigslist for a female Jack Russell Terrier and suspected it was from a puppy mill. 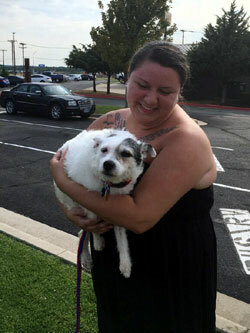 She wanted to save the dog and foster it but needed the support of Russell Rescue in order to do it. The picture of the poor little dog was sad. She contacted the person who had advertised the dog and picked it up. Ruby wanted to call her Gracie. 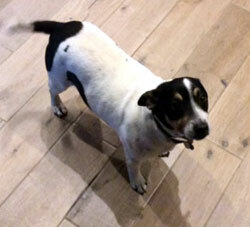 Beneath the thick, filthy, urine-stained, rough coat and fat was a very pretty JRT. Gracie was shaking uncontrollably and would not even move. After a visit to the groomer and the vet clinic, Gracie was ready to come home. For the first time in her life she was clean and safe and on a soft bed with access to grass. Ruby’s two personal Jack Russell’s were not allowed contact with Gracie because we knew that she would probably be afraid of them. With Ruby’s quiet and gentle instruction, Gracie learned to eat regular food and drink water from a bowl. She learned to use the bathroom on the grass. Ruby had Gracie two weeks before she had an emergency that would prevent her from caring for Gracie any longer. I had to get Gracie out of Iowa and to Texas within a week. And Ruby, trooper that she is, started looking at transport sites to help me get Gracie to Texas! She found a wonderful young woman named Courtney who was willing to drive 5 hours, but not further, because the price of gas made it too expensive. So, we paid her to drive Gracie all the way to Sherman, Texas. Had we not found Courtney, I don’t know what we would have done! From the very moment that Ruby told me another foster needed to be found for Gracie, I was a nervous wreck. Hours and hours of phone calling, and texting, and emailing ensued. At night, my right hand, arm and shoulder were cramped and aching from texting so much. Gracie had to have a health certificate and a new crate. She could not be allowed to get out of the crate on the way down to Sherman, Texas because we were scared to death that she might get loose. Had Gracie been a normal dog….a happy well adjusted dog, it would have been easier. But, she was a timid, frightened little girl who was losing the only human that had ever shown her any kindness. It took 9 people 7 days to plan this transport. Ruby rode in the car with a friend to meet Courtney that morning at 7:00 AM. She said her tearful goodbyes to Gracie and then turned her over to Courtney for the drive to Texas. Courtney drove 10.5 hours that day to Sherman, Texas. She arrived at 5:30 on July 26th. Gracie is now at her new foster home with Lecia trying to adjust. In the 18 years I have volunteered with Russell Rescue, this is in the top 5 of the most difficult things I have faced. Gracie still needs to be spayed and have a dental and a bump removed from her rear. But, for now……we are going to say a prayer of thanksgiving that we got her to Texas. Written by: Ruby, Volunteer, Russell Rescue, Inc. I wanted to say thank you to Terry for her patience in bathing the puppy mill dog Gracie I am fostering. Gracie was so filthy and urine-stained from laying in her own messes and smelled like garbage. Terry was so gentle and took such good care in getting her all clean and smelling good, probably for the first time in her life. Also, to the Anderson Veterinary Clinic and their patience examining her, giving her vaccinations, heartworm test, meds for her skin infection and mouth infection and other tests prior to her upcoming spay and teeth cleaning in a few weeks. Dr. Howard and his wife are top notch; they took care of Gracie. They helped get her interested in food since she did not want to eat or drink water. Since she was a breeding dog, she ate puppy mash all the time, more protein for her and to have healthy puppies. 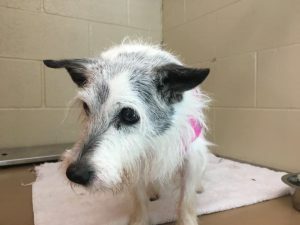 Gracie was very good for the veterinarian, and even though she was scared and shaking, she allowed them to do it all without a whine or whimper, and she didn’t lash out, either. 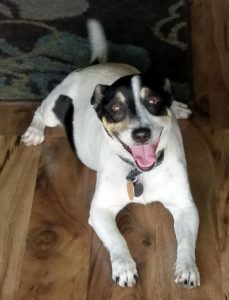 Gracie is a Jack Russell Terrier. She is 5-7 years old, very quiet, timid, and paces when she is out of her kennel, which is her safe place right now. She is not used to grass or being able to run around a yard after living in a pen all her life. She spooks at noises and is scared and cowers. In order for me to take her outside to potty, the kennel has to come out too and eventually she will creep out of it. I sit outside with her, and she will crawl within a couple feet of me now and that is progress; she will roll over, and I will scratch her belly. She follows me a short distance around the yard but keeps an eye on her kennel and won’t get too far away from it. If you walk up to her, she will crouch to the ground but she does allow you to pet her. She has to decompress and learn no harm will come to her, and that bad life is far behind her now. 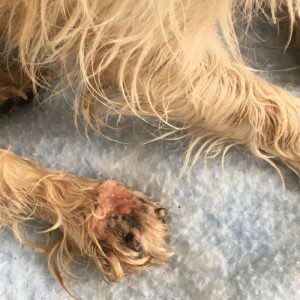 She has had a rotten life with no love or kindness, used only to make money for a horrible breeder that has no regard for his dogs. Yes, people, this is the ugly side to Iowa where dogs are viewed as livestock by our government, and puppy mills allowed with little care to the dogs. Since she is done breeding, they no longer had use for her and gave her away. 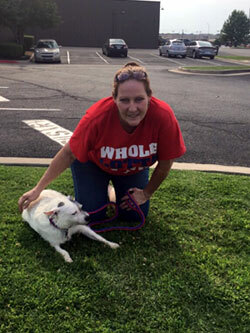 I am so very glad for Russell Rescue who answered my messages and reached out to help her. By God’s grace, which is where her name came from, Gracie now can learn what love, hugs and gentleness are. She has a second chance, and down the road, she can have a family to adopt her and give her a loving home for the rest of her days. Oh, oh Colonel Nugget!! You are the best!! You are such a good boy to share your chore money and allowance with your “Rescue Cousins.” We hope you had a wonderful time at the Yankee Trial and hope you are having a WONDERFUL summer!! Give you Mom lots and lots of kisses from us. Hi! It’s us, Whinny, Indy and Heidi! Thank you, thank you, nice Basketball girls!! Will you come and let us out of jail, too? 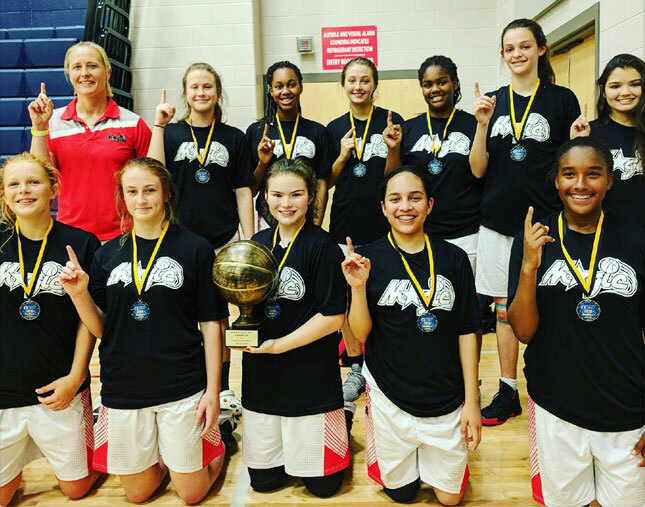 HUGE shout out of thanks to the Austin Lady Magic Girls basketball team and their coach!! Coach B. and her girls have sent in a wonderful donation for the sponsorship of Barbie’s puppies, for vet bills, food and other procedures. It does our hearts good to see young athletes using their skills to help others, and especially to help our animal friends. We wish Coach B. and her girls the very, very best of luck in their next season, and all of you should know, Whinny, Heidi and Indy will be cheering right alongside everyone else! Update July 25 – Here he is!! 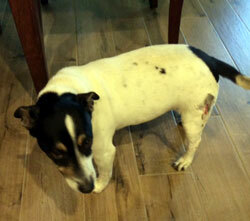 Sammie sailed through his surgery, and his incision is healing up nicely. He’s not quite ready to go to ground yet, but he is getting there!! Sammie’s biopsy was cancerous, but it’s a very slow growing form and only has a 5% chance of coming back. The best news of all? He found a forever family! Sammie is one happy little guy, and we couldn’t be more thrilled for him! Thank you all so much for your donations and support. 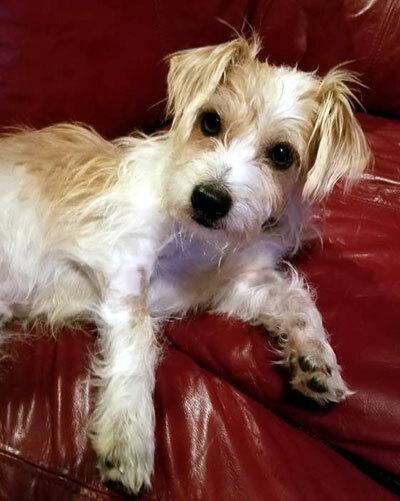 Sammie is healthy and home because of your generosity! 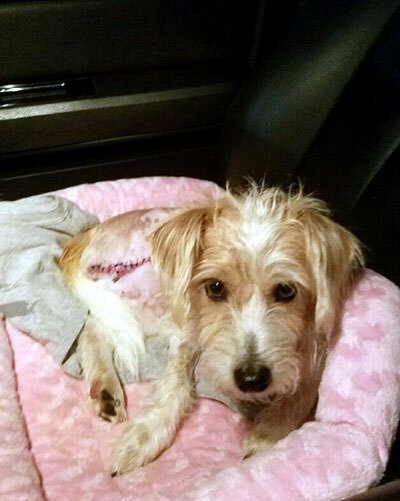 Update July 11 – We reached our goal and Sammie’s surgery is scheduled for tomorrow! Thank you all so very much for donating. We couldn’t do it without your support! 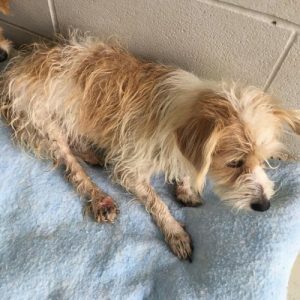 Sammie needs our help! He is a 9 year old bundle of love and kisses. The poor little guy has a tumor on his back right leg and another one on his back left leg. They need to come off because they could be dangerous. He’s a healthy, happy little guy and in good health otherwise. We want him to be able to run and play for years to come! Won’t you please help us help him? The vet estimates that Sammie’s surgery will cost about $600 and Sammie must have this surgery done before we can find his forever family. Please help us help Sammie by giving! 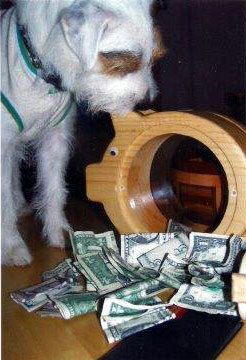 No amount is too small… it all adds up! You can donate with PayPal and all major credit cards. Please notate that your donation is for Sammie in the name field. Russell Rescue, Inc. is a non-profit 501(c)(3) corporation. 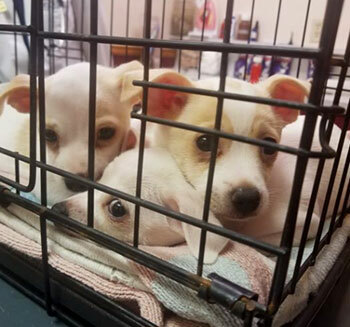 Donations made to Russell Rescue, Inc. are tax-deductible to the contributor. Follow along here for updates. Thank you from Sammie! Guess who is a Russell Rescue Inc girl??? 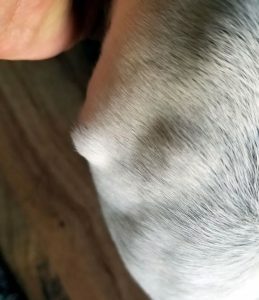 The little old girl we posted a few days ago is!! One of our amazing fosters Lecia saw her photo and fell for her. That got the ball rolling. Then transportation arrangements from Oklahoma to Texas had to be made. Volunteers for that had to be found. Luckily Heather found Dana S who volunteered to go pick her up and drive her part way to meet Lecia. Dana rearranged her entire day to help us and this little old girl, and Lecia sat all day waiting for her new foster after doing a different transport herself. When Dana picked up the little old girl she was laying her her poop and pee 🙁 but Dana still held her and put her in her car to drive her to safety. Then Lecia got her and drove her home. 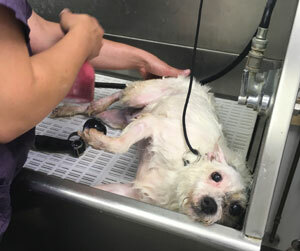 She was so covered in urine and feces she had to be bathed immediately. So Lecia gave her a nice bath. She was wearing a little shirt and underneath it was caked in feces. This poor 14yr old little girl was a stray no one came for. She spent about 10 days in the shelter and got lucky. Her teeth are in bad shape, and she has some mobility issues, but we don’t care. She is ours now and she will be safe and loved the rest of her days. 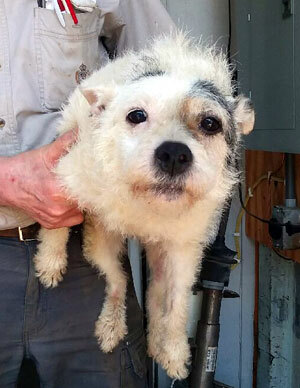 Thank you to all the volunteers that stepped up to help this little girl whom has since been named Gertie. Welcome to Russell Rescue Inc sweet old Gertie. 11/27/17 – Astro had his surgery last week and everything went well. He is at home with his foster mom recovering and enjoying being spoiled a little bit. He is already getting around better than he was before the surgery. Astro will be looking for a forever home very soon! We reached our $800 goal and his vet bill has been paid in full. Thank you so much for donating. We appreciate it so very much! Astro says thank you too! Colonel Nugget Harrell is a great Russell Rescue, Inc patron. He sends us half his earnings, every so often and is very generous to his cousins in Rescue. He gets money for chores, birthdays, etc. and always shares with us. 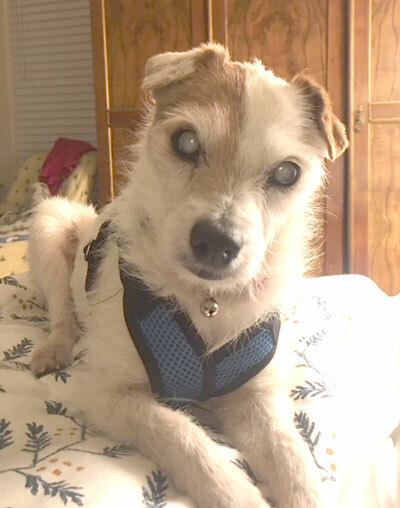 We are so hopeful Nugget will be able to visit us at the Texas 2 Step terrier trial in March 2018! Thank you, Nugget! We love you!! 11/23/17 – Astro is scheduled for surgery. As you can see from the video, he really needs to have it done. He drags his leg and rubs his foot raw. 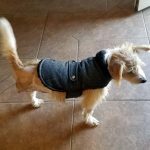 Once his leg is amputated, he will be much better! We have raised $195 of our $800 goal. Please give a few dollars if you can. It all adds up! Thank you! Astro came into Fort Bend County Animal Services in November with an injury to his back paw and leg. Russell Rescue got him into a foster home and to the vet to assess his injuries and it has been determined that Astro needs to have his leg amputated. He hobbles along and walks on top of his foot. 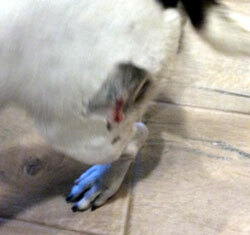 Astro’s leg is badly broken and damaged and has been for quite a while. 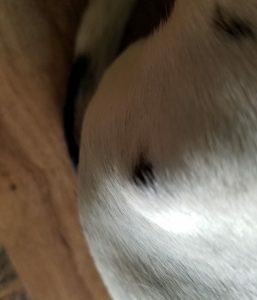 Astro is in pain and we need to get him scheduled for surgery as soon as possible. The vet estimates that the bill will be approximately $800. Please help us help Astro by giving. No amount is too small… it all adds up! Make sure you tell them it’s for Astro. Thank you from Astro!